Artcite Inc, 109 University Ave. W.
Tuesday, May 1 – Saturday May 5, 12 –5 pm (or by appointment). Local artists Collette Broeders, Elaine Carr, Susan Gold, Sasha Opeiko, Thomas Provost, A.G. Smith, and Martin Stevens will be engaging in a collective, week-long residency project at Artcite Inc. The artists will be focusing on conceptual and formal development toward a group exhibition next year. The group is made up of artists working in drawing, painting, installation, video, and architecture. 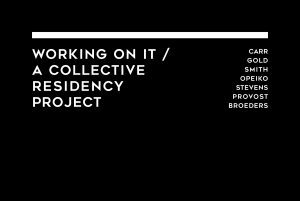 The residency is an opportunity for the group to engage in creative discourse and to assess overlapping concepts in their artistic practices and the development of work. Artists work through process and with materials, and these work processes often intersect despite varying individual approaches to artistic production. “Working On It”, as part of MayWorks Windsor 2018, will consider the visibility and accessibility of creative labour, while also expressing a need in the local arts community for more opportunities, forums, and spaces for artists in the region to collectively pursue creative labour and critical discourse. The artists plan to create work and collaborate, while remaining open to the public. By engaging with each other in this way, they will experiment with constructive ways of working together. At the same time, their process will be shared with the community and interested parties are invited to collaborate during the week-long residency.